This version...won't be remembered as a major one—it's too faithful and too wobbly for that—but it's an entertaining novelty version, largely justified by the casting and Gemignani's slavish devotion to the original Broadway orchestrations. 104 min. NCM Fathom. Director: Lonny Price. Cast: Neil Patrick Harris, Patti LuPone, Martha Plimpton, Stephen Colbert, Craig Bierko, Jon Cryer, Anika Noni Rose, Katie Finneran, Christina Hendricks. When it comes to getting butts in cineplex seats—and fans to collect home videos—the strategy has largely turned to event marketing, whether that be the must-see-or-risk-being-socially-ostracized blockbuster, or the see-it-and-impress-your-friends-at-cocktail-parties boutique title. The latter case of targeting a niche market to make a tidy, if not gargantuan, profit suits the work of Stephen Sondheim, beloved by those quaint minorities known as NPR listeners and theatergoers. And so we've seen, in just the last four years, three Sondheim Blu-ray releases from Image Entertainment. And two of them have been Company. Once considered by some a radical reinvention of the musical, the 1970 musical now unquestionably holds a place in the musical-theater pantheon as a beloved classic of the form. Revived on Broadway in 1995 and 2006, the show returned last year in a four-night concert staging, at Lincoln Center, helmed by two established Sondheim veterans: musical director Paul Gemignani (Sweeney Todd, among others), leading a 35-piece complement of the New York Philharmonic, and actor/director Lonny Price (Merrily We Roll Along, Sondheim! The Birthday Concert). The star-studded ensemble never performed as a complete cast until the day of the first performance—a result of the kinds of crazy schedules Company implicitly satirizes—but Price's crafty use of understudy-interns resulted in a surprisingly smooth staging that succeeds in being considerably more than a stripped-down concert staging of a Broadway play. It helps that Company was always stripped-down, with contemporary dress and a skeletal set. The story concerns a single man reticent—even as he turns thirty—to leave his comfort zone. This is Bobby (Neal Patrick Harris), who feels increasingly hemmed in by his circle of married pals. In a series of scenes casting Bobby as third-wheel "company" in the homes of his "good and crazy" friends, they mother and smother him with love and judgment. There's the comfortably worn-in couple of Harry and Sarah (Stephen Colbert and Martha Plimpton), the happily divorcing Peter and Susan (Craig Bierko and Jill Paice), contented newlyweds Jenny and David (Jennifer Laura Thompson and Jon Cryer), the about-to-marry Amy and Paul (Katie Finneran and Aaron Lazar) and the older couple of Larry and Joanne (Jim Walton and Patti LuPone), the latter on her third husband. Bobby sizes up each couple with a mix of affection, apprehension, and admiration. We see his dating life at its most casual, but also as it is affected by Bobby's increasing consideration of long-term commitment. Will the eternal boy grow up and settle down with one of his stable of girlfriends? Flight attendant April (Christina Hendricks) is a sweetheart, but a bit dim. Perhaps it's not to late for old flame Kathy (Chryssie Whitehead). And the smart and sassy Marta (Anika Noni Rose) wouldn't let Bobby get away with anything—perhaps just what he needs. Accompanied by a cleverly compact book by George Furth, Sondheim's music and lyrics fire on all cylinders. The choral complexity of Company brilliantly sets the stage for Bobby's emotional claustrophobia, and from there, it's one nugget of musical genius after another. Particular standouts: the Andrews Sisters-styled "You Could Drive a Person Crazy" (April, Kathy, Marta), the Bobby ballad "Someone is Waiting," Amy's showstopping musical meltdown "Getting Married Today," the peppy "Side by Side by Side" (Bobby and the couples, here taking on an aggressively Vaudevillian aspect), and Joanne's bourbon-soaked social self-critique "The Ladies Who Lunch." This version of Company won't be remembered as a major one—it's too faithful and too wobbly for that—but it's an entertaining novelty version, largely justified by the casting and Gemignani's slavish devotion to the original Broadway orchestrations. Price weds stars of the Broadway stage (Finneran and Lazar), stage and screen (Harris, LuPone, and Rose), and primarily screen (Colbert, Plimpton, and Cryer) for a cast with crossover appeal to the Lincoln Center audience and the audiences that saw the live-to-tape "Fathom Events" presentation in movie theaters. Harris proves solid but a bit uninspiring, which could be said of the whole enterprise. Colbert is a hoot in his scene with an equally droll Plimpton, though he's not as confident when he has to sing a sincere solo; similarly, Hendricks, Whitehead, and Rose do fine on their own, but "You Could Drive a Person Crazy" turns into something of a disaster, since the three (who probably didn't get to rehearse together much) fail to blend vocally. Surprisingly, it's the ensemble numbers like the expansive title number and "Side by Side by Side" that tend to impress, with precision movement on a small playing area. The unequivocal winner, though, is LuPone, who delivers a devastating "Ladies Who Lunch." It may not have you saying "Elaine Strich who?" but it comes close. 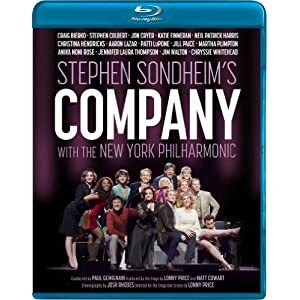 Image presents Stephen Sondheim's Company with the New York Philharmonic in a good-lookin' hi-def transfer on Blu-ray. Color pops nicely, and the image is consistently crisp thanks to the potent stage lighting. The lossless audio also serves the material well, especially in the warmly captured orchestral sound. The radio mics on the actors perform nicely, as well, though the live mixing doesn't give the complex audio quite the same polish of heavily post-produced titles. Thankfully, Image has seen fit to include subtitles for the lyrics and not just the dialogue; the menus also offer direct access to some (but not all) of the musical numbers. But that's it: no extras per se—not even an EPK roundup of interview clips. Of course, the play's the thing, and it gets a fine A/V treatment here. All site content © 2000-2019 Peter Canavese. Page generated at 04/25/2019 03:25:11PM.